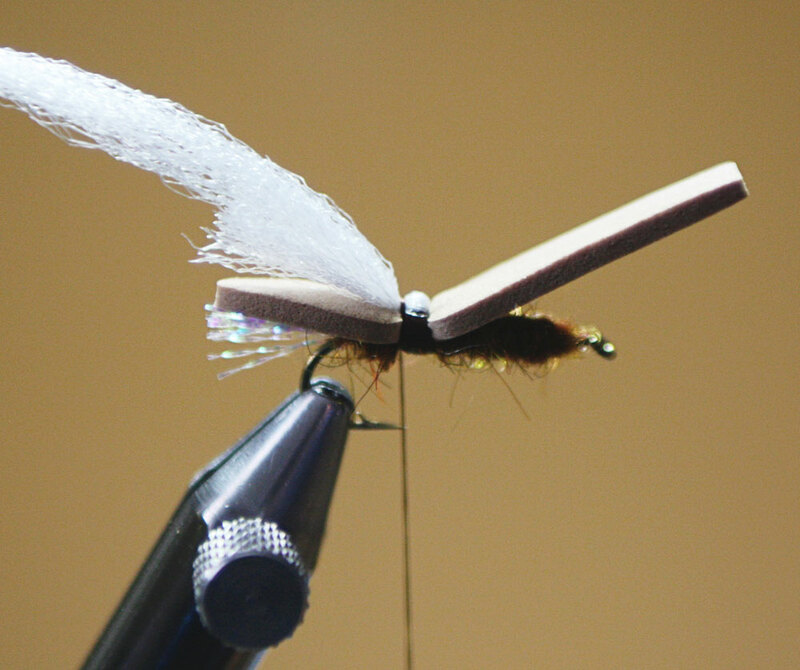 The Chubby Chernobyl has been a great fly the last couple of years, if not the Top Fly for fishing the Madison or Yellowstone Rivers in Montana. 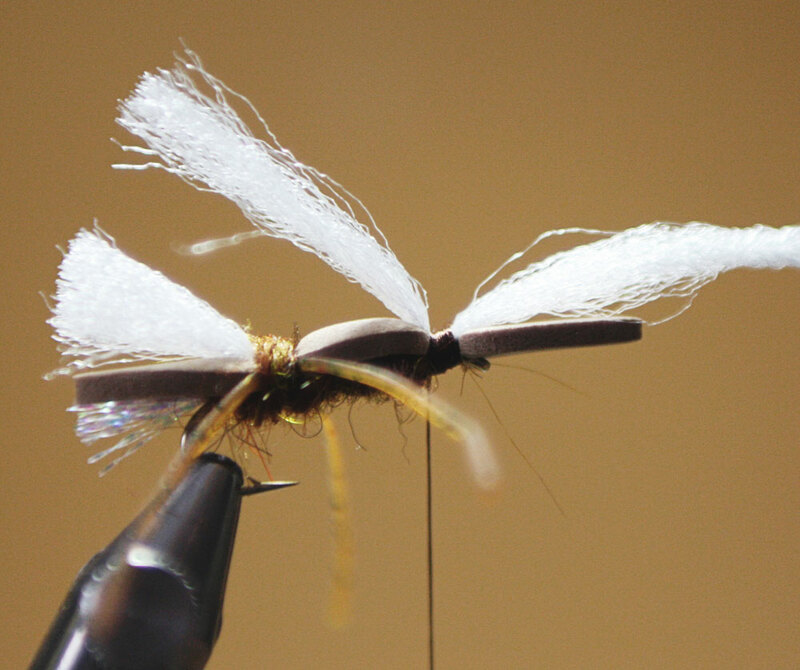 This high floating fly is virtually unsinkable and very easy to see on the water with its high upright wing. 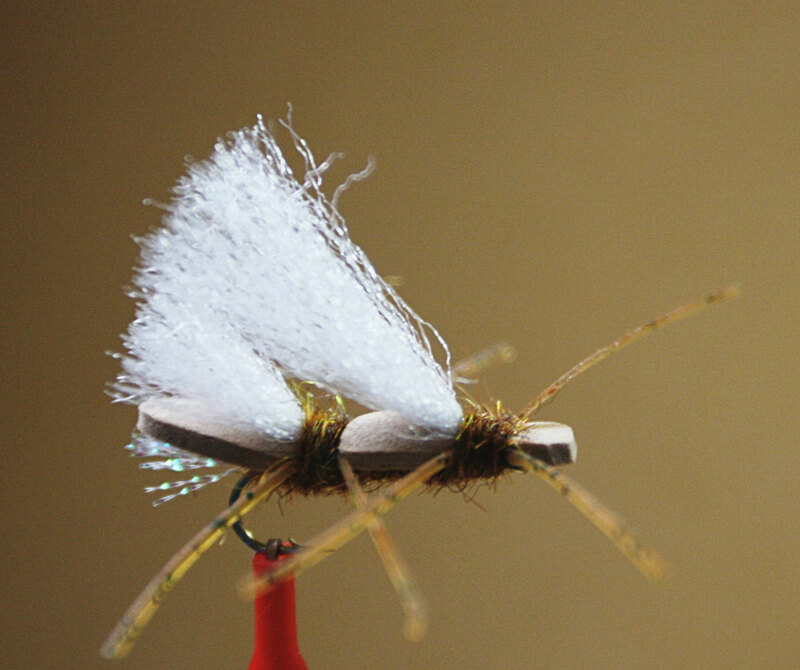 The Chubby Chernobyl is a great general searching pattern that can be used to imitate Salmon Flies, Golden Stones, or hoppers depending on size and color. The Chubby also makes an incredible hopper-dropper fly due to its high buoyancy and easy visibility in all types of water. 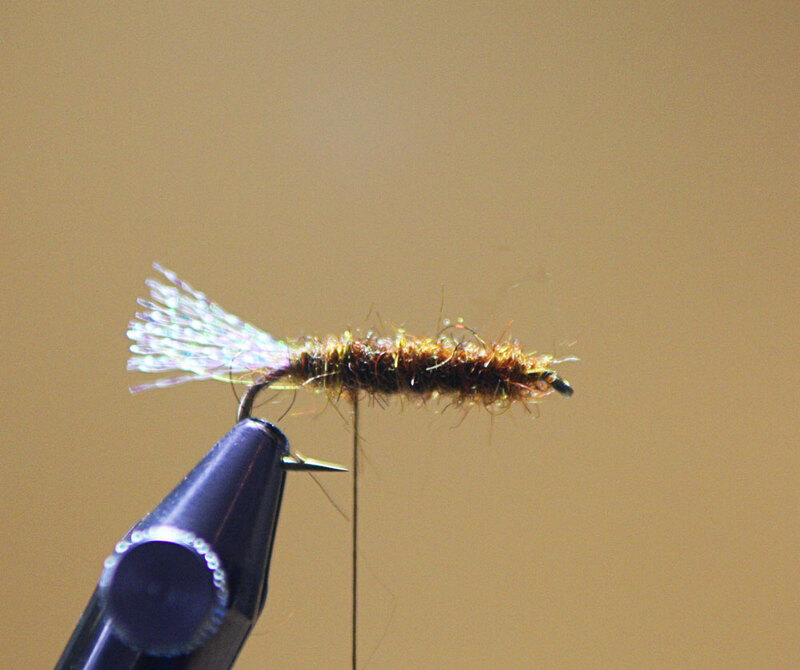 I like to fish this fly in black, tan, brown, pink and green body colors. 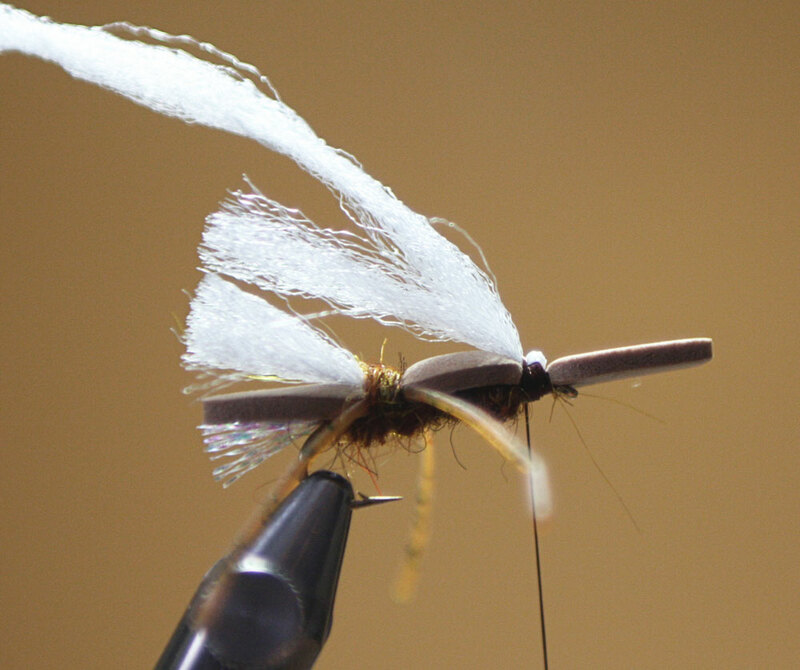 This fly is easy to tie and very durable, so tie up a few, you won’t be disappointed. Hook: Dai Riki 730 sz. 8-12. I use 2xl long nymph hooks instead of dry fly hooks for most of my hoppers. These are stronger hooks with a big gap and them seem more durable than dry fly hooks. This is a great thread for tying foam patterns because the thread lies flat, therefore, doesn’t cut through the foam like braided or twisted threads. My favorite poly is McFlylon. I have also used EP Fiber and Ice Fur with good results. Straight poly yarn also works, just seems to become waterlogged quicker than the other poly material. 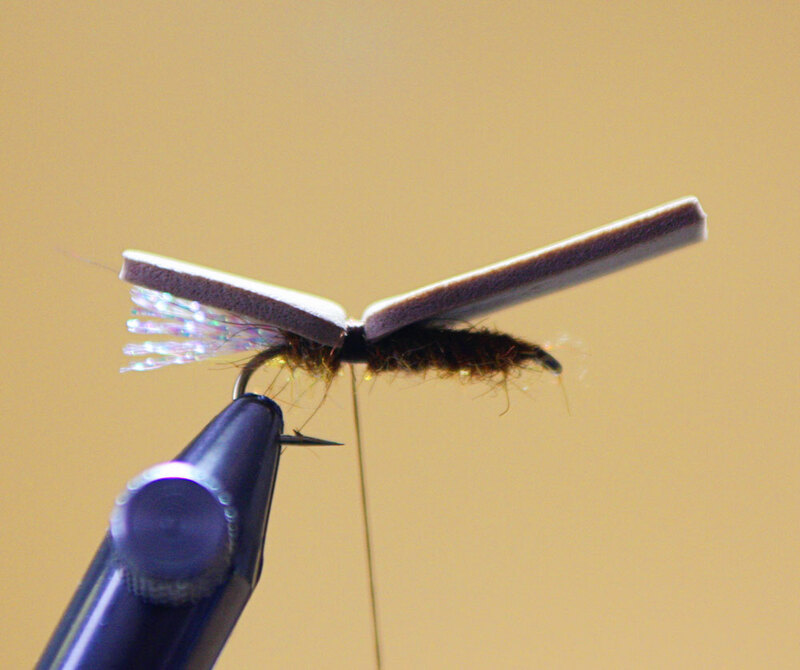 McFlylon seems to keep its shape best and comes in perfect sized strands for wings on sizes 8-12 flies. We also have a Montana Chubby Kit on the store that is similar to the Chubby Chernobyl but with a custom body shape. The kit includes bodies, legs, and poly wing. 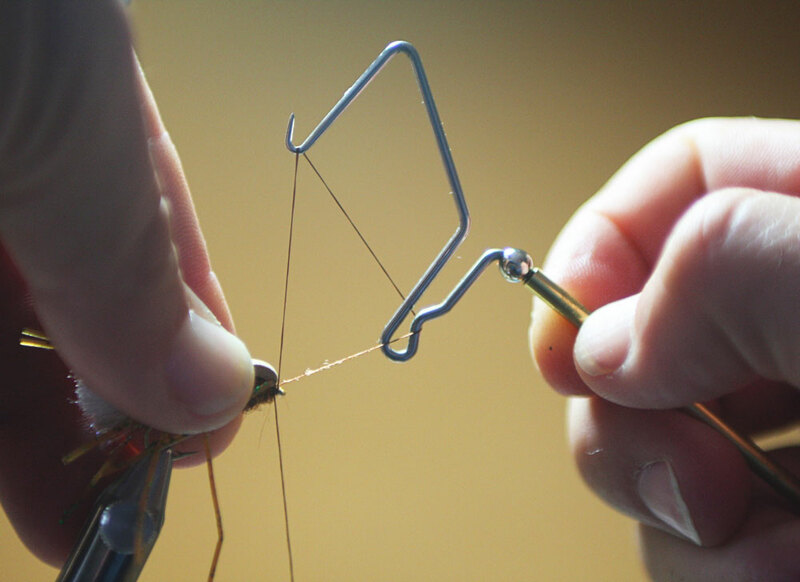 Step 1: Start the thread base at the eye of the hook and wrap back to the barb of the hook. 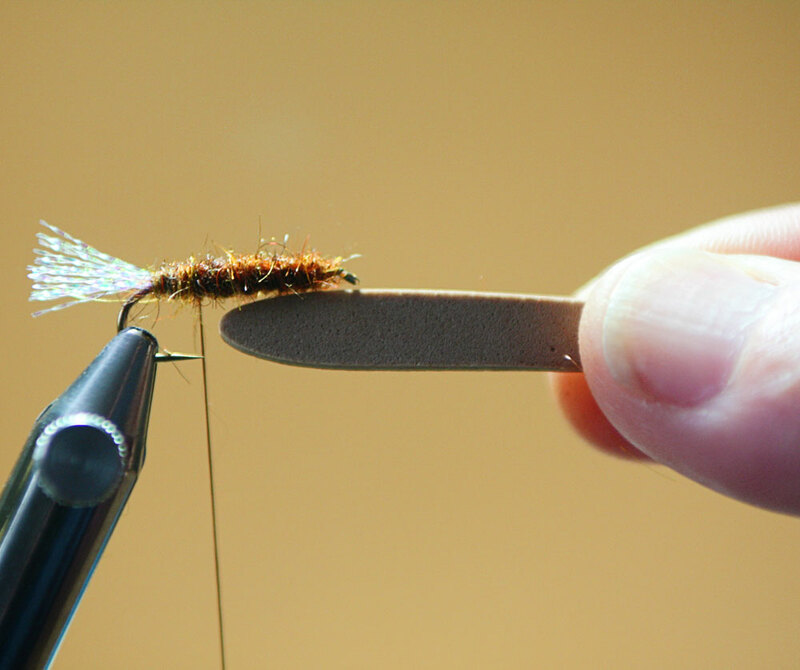 For a more durable fly, wrap a 2 to 3 layer thread base. Step 2: Tie in crystal flash tail on top of hook. Tail should be about twice the gap of hook in length. 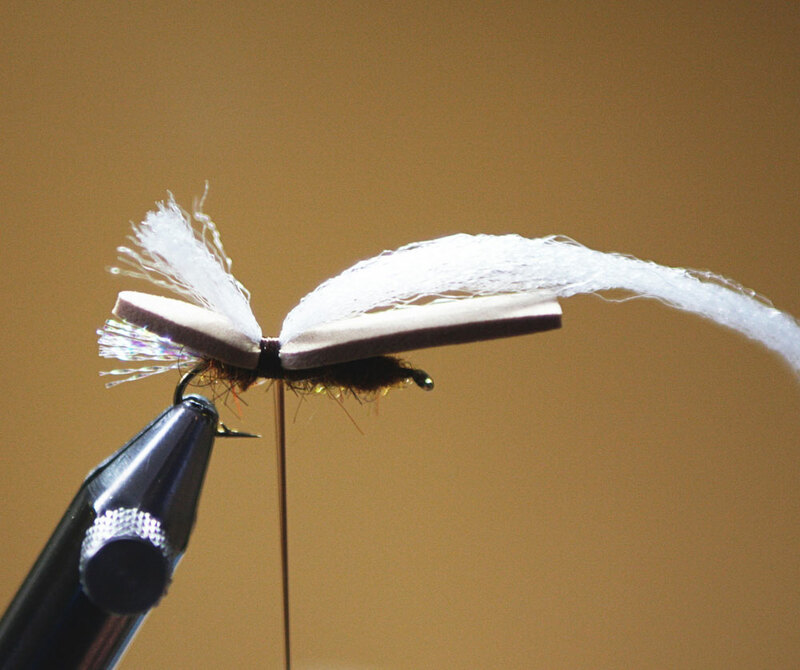 Step 3: Apply dubbing to entire fly working back and forth making a nice robust tapered body. 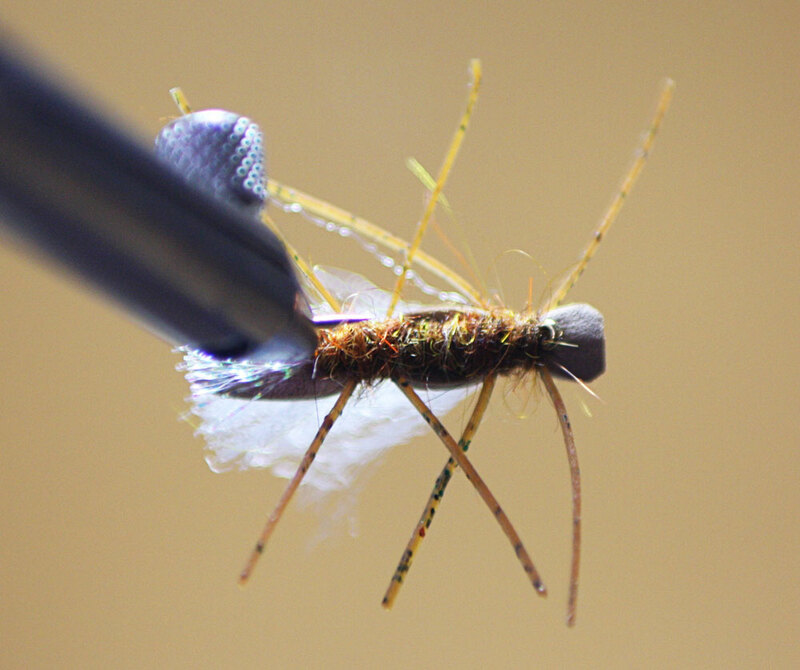 The body should look like a nymph body at this point with the thread ending at the point of the hook. Step 4: Trim a piece of 2mm tan foam to shape, or use a medium sized chernobyl foam cutter. The foam body piece should be as wide as the hook gap and about 2 inches long. Step 5: Tie down foam piece on top of hook with a dozen wraps or so. As you bind down the body, make a small gap in the foam (see phot0). Back of foam body should extend to end of tail. Step 6: Tie in wing material and extend wing to end of tail and body. Wing material should be at least two inches long because it is going to be folded over in next step. Step 7: Fold over front half of wing material and tie down directly over the top of the lower wing. Notice the tie down is directly above the point of the hook. Trim to same length as lower wing. Step 8: Make a thread base for legs. 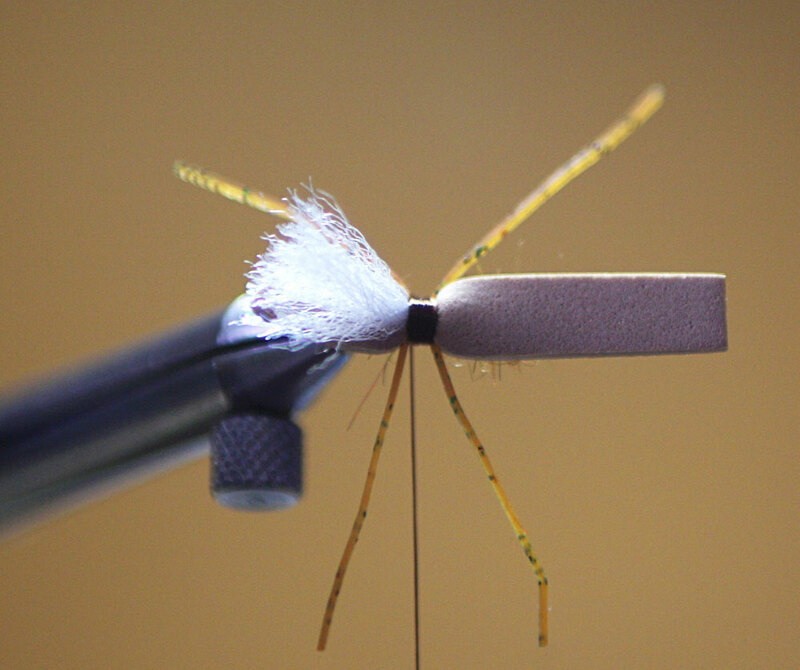 Attach about a 2 inch strand of sili legs on each side of fly. Legs should be tied in so the legs are parallel with the foam body. Step 9: Apply thin layer of dubbing to thread and fill in gap between legs of fly. 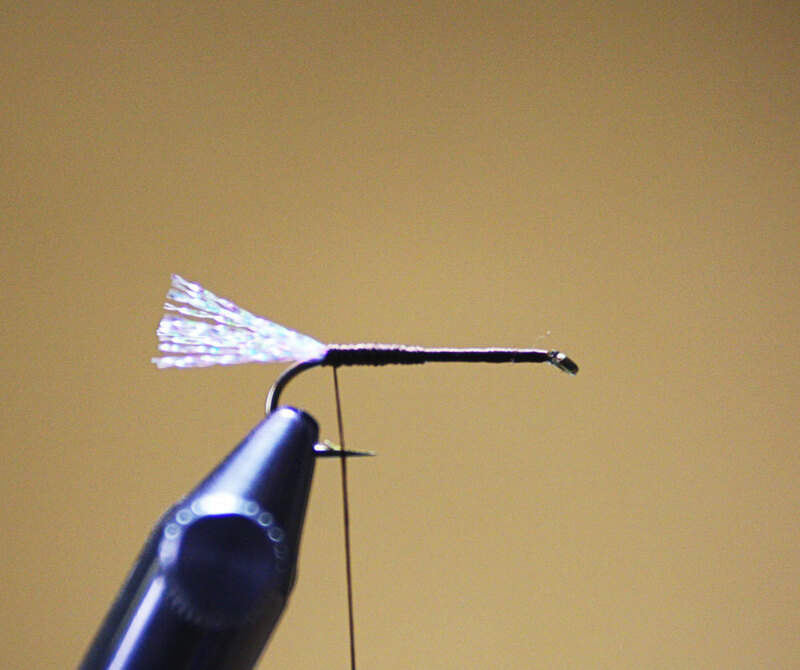 Advance dubbed thread to front of fly, just behind the eye of the hook. Step 10: Tie down foam body just behind eye of hook and make another gap in the body like step 5. Tie in wing material and extend lower wing to end of tail and body. Step 11: Repeat step 7. Bind down top half of wing directly over the top of lower wing. Notice tie down of upper wing is towards the back of the gap in the body, about 2 eye lengths behind the eye of the hook. Trim the upper wing to length, same as the lower wing. Step 12: Make thread base for the legs and tie in sili legs on both sides of body. Again, tie legs in parallel to foam body. Apply thin layer of dubbing, just enough to fill in gap in front of wing. Step 13: Pull back foam head and whip finish directly behind the eye of the hook. Step 14: Trim head of fly to shape and trim the legs to desired length. I usually like the legs about the length of the hook. Send me some photos of your finished Chubby Chernobyls and let me know how they work out for you. Now that is some pretty fancy belly button fuzz! It’s all about the photography! Thanks for detailed training! Really informational! Will try it.. The Chubby Chernobyl was my go- to fly while guiding this year. It floats forever, supports a weighted beadhead, and more importantly, fish eat it. thank you for sharing your fly. Seems like a good one to use. very nice step by step.